I am convinced that Hell is not as Dante depicted, all fire and torment and helpless souls chained to walls, flesh being pulled off in chunks without end, Amen. No, Hell is a place of eternal dullness devoid of sense or sensation, a joyless realm of complete indifference. There, the coffee is execrable. Harsh beans, poorly roasted, are ground too coarse and used sparingly, producing a thin brown water than burns for hours on a Bunn-O-Matic until the vapors smell like a soiled scrub sponge that has been kept damp in a dark sink cabinet. In Hell there is no reverie. You see, here's the secret of chiles. People don't eat superhot peppers because they like the sensation of mucous membranes being seared raw. No, chile aficionados like the evil little vegetables because they cause the brain to produce profuse amounts of endorphins, morphinelike substances that can alter your mental state significantly if you get enough going at once. Of course, opinions about cannabis and its effects are highly polarized. Some people regard marijuana consumption as a fairly innocuous and pleasurable pastime that should be legalized without further ado, while others consider it a menace, an evil that destroys the mind and corrupts the fabric of society. One thing is certain: Cannabis is with us to stay. Drug eradication efforts have only invited cleverness on the parts of growers, dealers, and users. "Chris Kilham offers to jog the mind with good psychoactive plants -- a sound prescription. 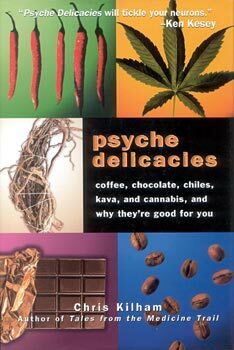 A bit of coffee here, a bit of cannabis there... Agree or disagree with him, Psyche Delicacies will tickle your neurons. A good blend of humor and argonautic escapades." -- Ken Kesey, author of One Flew Over the Cuckoo's Nest.